In a house full of girls, you know that it's only a matter of time before one of them takes a pair of scissors to her head. My middle daughter gave herself a mullet when she was about 2, lopping off the sides of her long brown locks in two quick snips. 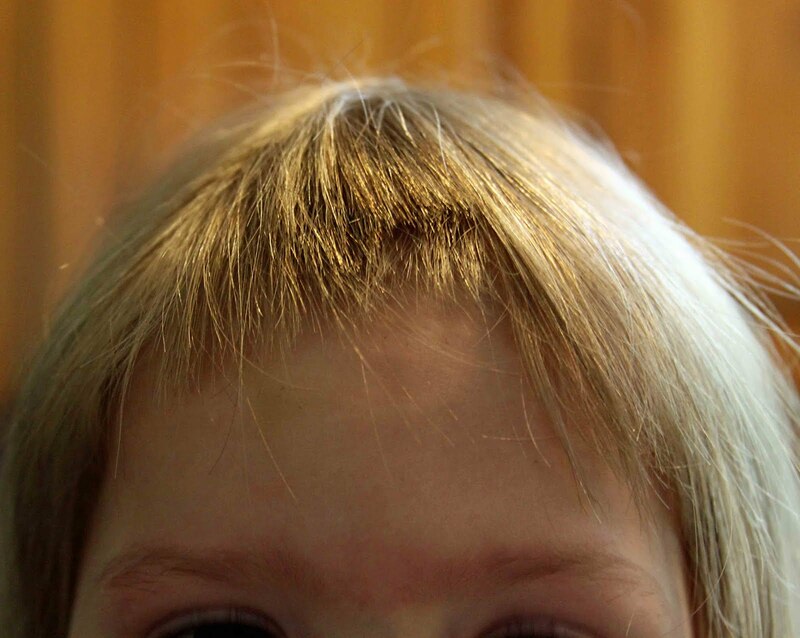 My eldest child held off until she was in the 5th grade before deciding that she was old enough to cut her own bangs. If I were honest, I'd have to confess that even I have tried to trim my split ends using a hand mirror and my scrapbooking shears. So why bother getting upset when one of my 4-year-old twins circumvented all security measures and accessed some scissors in the bathroom . . .
Would it gross you out too much if I admitted that the scissors she used were a tiny pair of round-ended nosehair clippers that my husband keeps in his shaving kit? The title of your post says it all. I am dreading the day this happens in my house. It could be way worse. Mine hasn't tried it yet. And I stress the word YET. Shhhhhhh .... don't give my girls ideas! Oh my. I like the way she improvised. Oh yikes...that was quite a trim! I don't know how I escaped that. OH NO!!!!!!! That is quite the butcher job right there! Look at it this way...you can make your husband feel guilty, telling him it's his fault since he left the "shaver" where she could get to it! Bella has done this to her hair many times. Her bangs are finally just growing in. I'm really hoping this is a girl thing, because the moment my boys find out about scissors, our lives are over. Oh MY! Chena did that too, and at age four. I'm not as mature as you are, I CRIED! I could not believe she had gotten ahold of scissors when I was so careful. Now I know that you just can't prevent it. :) Hair grows! Right? LOL. I was one of those weird girls that never had the inclination to cut my own hair. I'm sure my mother is grateful. I'm kind of bummed there aren't any such mishaps in our family photo album. Oh no! I hope mine never thinks of that!